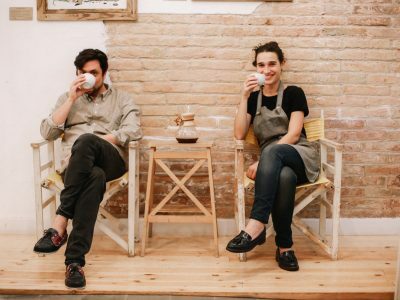 Tucked away on a back street in the barrio of Gràcia, SlowMov is a hip artisan café serving freshly roasted and specially crafted coffee. In this People On The Grid podcast, we meet with Carmen Callizo and François Justet from SloMov. We discuss the start of SlowMov and how they embrace the concept of slow, diligent processes of elements that are required to make artisanal products. The SloMov community lives by the philosophy of ‘collaboration within societies.’ They work and want to show people how processes and timing in creation works. All of the things that are done with time, the right timing, doing things step-by-step. Hence, their name SloMov emphasizes this process of time. They love what they do, so much that they are actively attending “cuppings” which are like coffee tastings. And want to find the best. Their coffee is sourced from all over the world depending on the season. They change every couple of months but have blends from Brazil, Guatemala, Kenya and much more. SloMov is changing the way you buy coffee, going straight to the producers – in turn, they tell the producers stories to customers, have more information and a deeper connection. SloMov is storytelling for coffee lovers here in Barcelona. Listen to our interview with SlowMov here.